Humidity is below the set humidity start means that when soil moisture is below the set humidity , the relay will automatically pull, start spraying , water pumps , etc. do humidifying action reaches the set humidity is automatically stopped. Adjustable via potentiometer control soil moisture threshold , which can automatically vegetable garden , garden automatic watering , household pots of soil moisture control , electronic game , etc., with a power relay , can control high current devices , less than the set humidity automatically start relay , more than the set humidity automatically disconnected , and a delay function to resolve without delay the humidity critical state relay flickered question is a simple and practical soil moisture control system. 1 using the company\’s high-quality soil to make the soil moisture sensor detection surface is nickel plated, has widened sensing area can improve conductivity, prevent rust easily contact with soil problems and prolong life . 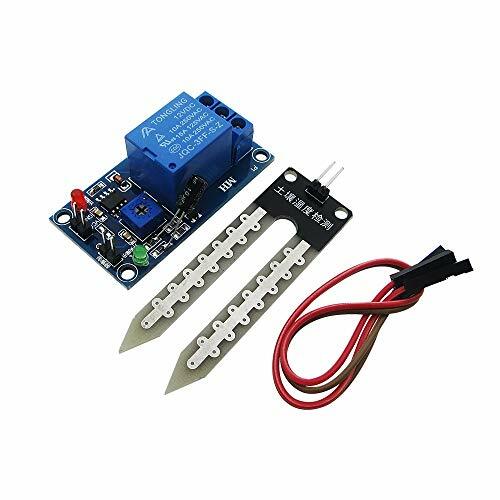 (2) products can be controlled over a wide range of soil moisture , adjustable via potentiometer control the corresponding threshold , the humidity is below the set value, the relay starts , higher than the set value, the relay is switched off . 3 product with a delay function , delay 3-5 seconds , when the humidity in the critical condition is detected , the relay does not flicker , flicker occurs . 4 high-quality products using Songle relay can withstand the load of 1500W , meet the requirements of most people . 5 products with a power indicator and relay instructions . 1 soil moisture sensor for detection .